Sweeping Mauka and Maka x2019;i Views! 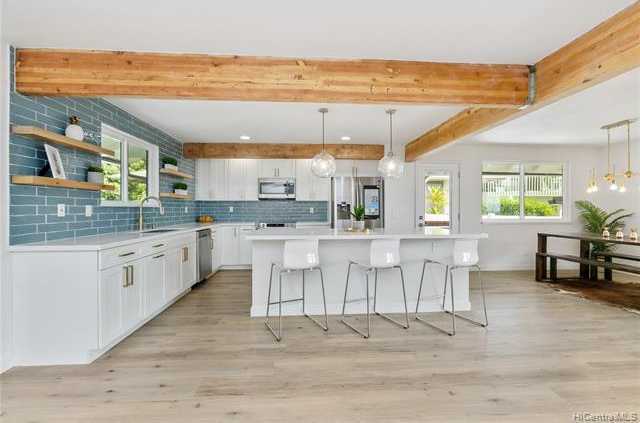 This Fully Remodeled Modern Contemporary Single Family Home with gorgeous finishes sits on an 8,212 sqft lot backed against a tranquil mountain fed stream. The Open Floor Plan includes a fully upgraded kitchen with all new stainless steel appliances and fixtures. The spa-like bathrooms are beautifully tiled. Possibility for Rear Rec Room to be used as second master. Luxury vinyl plank flooring runs throughout. Split A/C in each living area. New electric rewire and plumbing throughout. A MUST SEE! Please, send me more information on this property: MLS# 201901510 – $1,420,000 – 932 Lawelawe Street, Honolulu, HI 96821.